The audio system is anchored by a flown center array of eight JBL VerTec 4887A and augmented by a pair of flown VT4881A subwoofers. The entire eight-box array flies out of sight through an overhead trap door when not in use. TORONTO, ON, CANADA—As the principal performance venue for the Royal Conservatory of Music in Toronto, the new Koerner Hall hosts not only classical music but also amplified concerts by notable jazz, blues, and world music headliners. 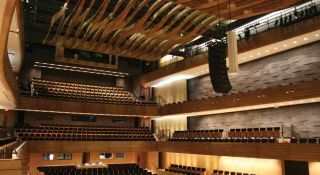 Koerner Hall was designed in the classic European “shoebox” format by KMPB architects, and endowed with N1-rated acoustics by U.K. acoustical consultants Sound Space Design. The “live” acoustics are ideal for symphonic and choral music, but with variable acoustics supplied by moveable curtains, the venue also presents a characteristic well suited to the robust sound reinforcement system which was installed in the venue. For the underlying audio infrastructure of digital signal processing, matrixing, and distribution, Koerner Hall relies on a network of a dozen BSS Soundweb London BLU series components, including four BLU-160 units and two BLU-800 units, both featuring the high-speed BLU-LINK digital audio bus and four times the signal processing power of prior generation BLU series units. Many other Harman Professional Group components work in harmony with the main reinforcement and digital infrastructure systems. A total of 84 additional JBL AE and Control Series loudspeakers are deployed as main system fills or in the associated PPM (paging program monitor) systems. The PPM systems are powered by 10 Crown CTs Series amplifiers. Also, the hall’s microphone locker is stocked with 13 AKG microphones, including a quartet of the world-standard C414B-XLS variable pattern condenser models.